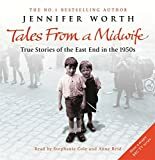 Price comparison results for Jennifer Worth - Tales from a Midwife: Call the Midwife, Shadows of the Workhouse, Farewell to the East End are listed below. The cheapest price including postage is listed first, this assumes that the purchase does not qualify for free delivery. Many of the retailers offer free delivery above a certain total order value. If you are thinking of purchasing more books than just Jennifer Worth - Tales from a Midwife: Call the Midwife, Shadows of the Workhouse, Farewell to the East End it may be that the top (cheapest) price is not necessarily the best. Others may be cheaper, you are advised to check the latest postage free prices by clicking the relavant links .